I lightly tapped a side curb with the left passenger wheel and it scraped. Most people wouldn't even notice, but I sure do. The good news is I have the wheel and tire insurance, so it won't cost me anything to have it fixed. I'm still waiting for the drivers door window to come in from Germany. 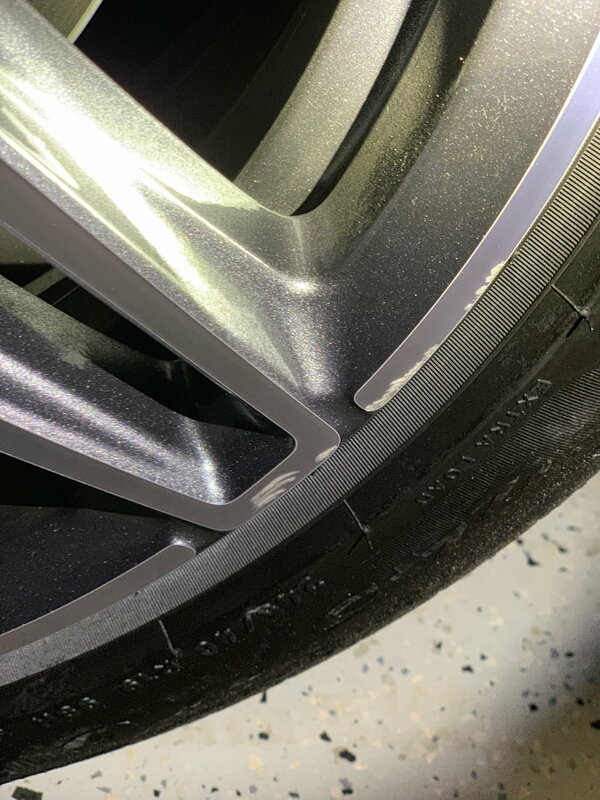 When I get that scheduled, I'll have them get the wheel magician (these guys really can fix wheels so well, you can't ever tell) to take care of the little scrape. Still mad at myself for getting close enough to a curb to scrape the wheel. For the window are you currently driving without a window on your car??? LOL jk, why do you need a new window? I knew someone with a brand new CLA250, I mean like less then a week old. In their neighborhood there are big rocks so people don’t drive on your driveway. Making a left, scraped the rear driver lower door panel and ran over the rock with just the rear wheel. Cost $1,100 out of pocket. Last edited by mobster600; 11-21-2018 at 02:20 PM. LOL........Here's the picture. Like I said, most would simply not worry about it. But it will bother me and I paid for insurance, so they have to fix it for me. Yes, I'm driving around without a drivers side window. JK. Actually, on delivery, there was a tiny chip in the glass. A brand new car should not come with any chips in the glass, so they ordered a replacement window, which of course has to come all the way from Germany. You'd think they'd stock windows in the US somewhere, but they just don't. Rod, don't spare a tear. On many of my last cars, I have curb rashed them. It's the most painful sound, but parking in NYC, it's bound to happen. Take solace that the wheel magicians are just that...magicians. I don't know what they do, what tools they use, or what spells they cast, but wow, the wheels always come back looking gold. Thanks. I'm sure once the wheel magician waves his wand, it will look good as new! I guess there will be more to come. Sorry to see your curb rash damage, imo the design of these wheels is really nice, and hides brake dust really well. I'd like to think the wind did it to you too, but my money's on a customer who has zero consideration and was too lazy to walk the cart to the cart holding pen. Once we see a boo-boo, they just can't be unseen unfortunately. Oh my..........I hope you have wheel and tire insurance? That's quite the boo boo and I'm sorry to see that. Holy crap. How did that happen? I've been babying my wheels since I got the run flats, trying to avoid potholes etc, but that's a seriously wrecked tire. Ah Mike, sorry to see that. Emblematic of the road conditions in NYC. It's why I went with 18" wheels when my heart screamed 19" or even 20". Do you have wheel insurance? Those look like the AMG 20s. Can't be inexpensive. That tire and wheel ins is a good thing. I was amazed at the price difference from Rhode Island VS Florida. In RI they were talking 2600 bucks when I bought my 2018 AMG in Florida its 1000 bucks I think it's 6 years too. Potholes make all the Difference and in Snow and ice areas there are lots of them especially in the winter. Practically none in Florida. I also bought the ding and dent insurance by Dent Wizard. It was 795 bucks but a good deal when I get dinged, again good for 6 years. They should be able to fix your wheel in about 15 min, the other wheel damage pic time a for a new wheel and tire. 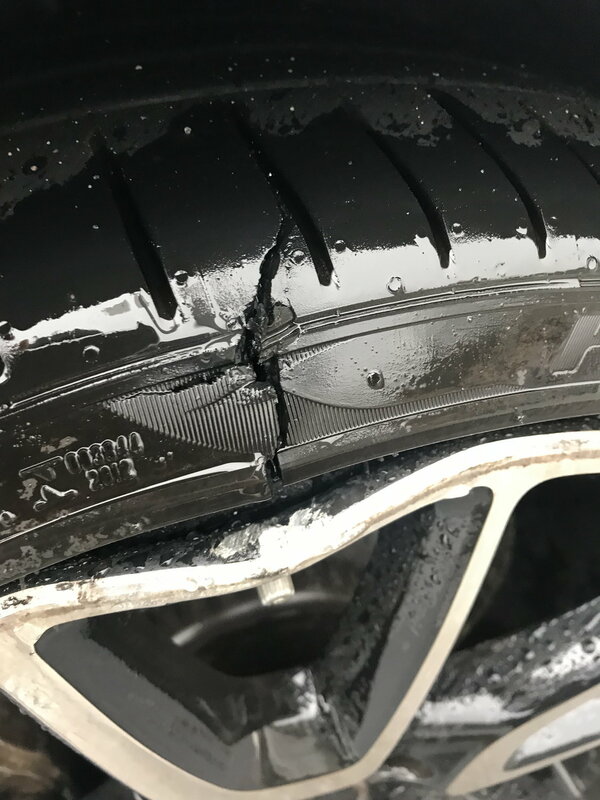 I hate curb rash. I try to be super careful but occasionally just letting someone run an errand results in my vehicle returning with some damage. I also got the tire and wheel package for two of my cars including the Merc but even if I didn't have protection I'd still have the work done. I'm sorry this happened, it's a bummer for sure. I'm glad you have the wheel and tire insurance, it'll be good as new. The only positive, if there is one I guess, is that you know who/how the damage happened. That is spectacularly awful. Hopefully all is well soon. Yep, I know who did it and how. Twas me and it barely came in contact with a curb. Translation: These 19" wheels, for all of us who have them better be UBER-SUPER-DUPER-ULTRA careful with these things! Yeah, when I saw the image you attached I was thinking that it must have been the lightest touch to create those marks. I gave my dealer a call to enquire about wheel protection (insurance) on my 450 coupe. Just waiting for him to get back to me with some info and a price. Well fawk, it's not new anymore man! With these wheels and RFT tires, for me, Wheel and Tire insurance is important. My boss didn't get it on his S550. Over the last 3 years, he's replaced 3 tires and two wheels. The cost he's incurred has far exceeded the cost of the insurance. But as is the case with any insurance, you may never make a claim, so it's a gamble either way. I choose to be protected. Sniff, Sniff. Nope, it's not. But it will be fixed soon. i was staying in a hotel this week which had an underground car park built some years ago and it was really scary as the entrance was by a curving ramp with high kerbs either side. The car just fitted and the journey down 3 floors and back up was very slow my fear was just the type of damage you sustained on the just installed new wheels and winter tyres. and like you i would really notice that damage. Glad to hear your car's going in tomorrow. It shouldn't take them long and when you get it back this will be a distant memory. I've had to navigate garages like you describe. They're tortuous and the makings of nightmares! Me and curbs aren't good buddies. I never dinged a single wheel on my C300 in the full 3 years I owned the car. But my worst encounter with a curb was with a brand new Mercedes CLK500 Cabriolet. I had just signed the papers and taken delivery of the car. It was lunchtime when we left the dealership and we decided to go to Panera Bread. The one we went to had the worst curb system that to this day, I won't park there. Anyway, I wasn't familiar enough with the new car and I hit the curb. I didn't just roach a wheel, I bent it. So, 30 minutes after taking delivery, with my tail between my legs, we went back to the dealership and I had to buy a new wheel. It was an AMG wheel, meaning it was really $$. That was the last car I ever bought without wheel and tire insurance. Last edited by rbrylaw; 11-25-2018 at 06:00 PM. Sadly, I skipped out on it this go around after having it on my last 5 MBs, go figure! Improper road repair left a huge hole which was unavoidable without veering into a bus in the left lane. Was able to slow down to about 30 but as you can see, didn’t help much. Wheel and tire were replaced. Thanks me too (of course). Going from an E43 to a loaner GLA for a week was even worse lol. Yes, AMG 20’s, wise choice for NYC/Queens right? Agreed with you on the protection even though I didn’t listen this go, won’t make that mistake again but I guess when I factor in not having used the wheel/tire insurance for the last five I’m about break even or maybe ahead. Hope you get it fixed and back to “new” real soon, I know it would kill me too. Mike, try contacting the city. My nephew did in Charlotte, NC and the city paid for his new tire and wheel.